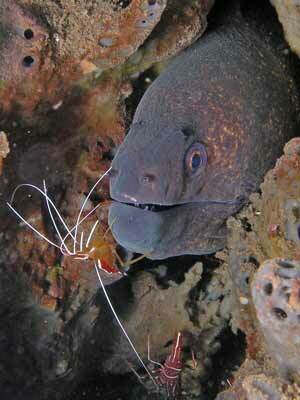 Seraya Secrets is a dive site located about three kilometres south-east of Tulamben. An approximate GPS mark for the beach at the dive spot is 8° 17' 44.6"S 115° 36' 43.1"E (using WGS84 as the datum). On the main road just to the south of Scuba Seraya Resort there is a sign that says something like "Good Diving" and a list of things to see. The track leads to a car parking area behind the beach. There is also a small shop here that sells drinks (including hot coffee) and snacks. 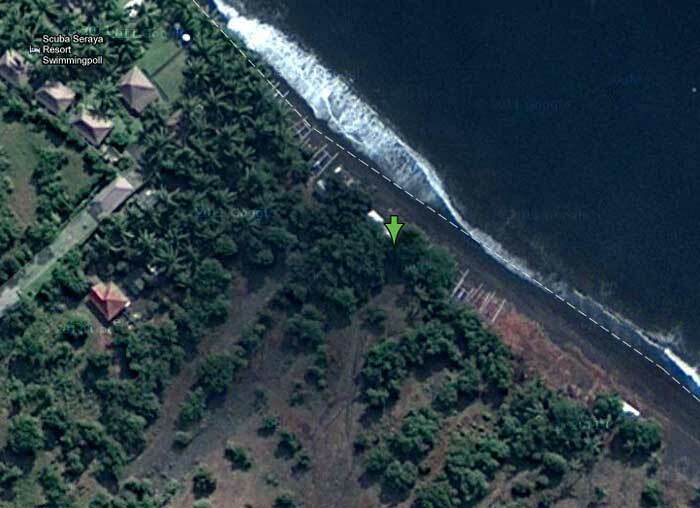 Unlike most of the other sites at Tulamben, this one is accessed via car. Rather than gearing up at the shop, you normally do this (from Tulamben) as a double dive. You load all your gear into a ute or van and then travel the short distance to the dive site. At the site there is a small parking area and a covered shade area with some low tables. This is excellent for putting cameras etc on. Once at the site you put on your wetsuit and then enter the water. I would not take anything too valuable with you, but make sure you have some money to buy a cold or hot drink after the dive. As in the other nearby dive locations, the beach is composed of rocks. However, here they seem to be much smaller and it is a lot easier to walk over the rocks without risking a twisted ankle. Once in the water you put on your fins and descend. The bottom here away from the beach is black sand. There are actually two dive sites here, Seraya Secrets (Left) and Seraya Secrets (Right). I will do Seraya Secrets (Left) first. When underwater you head straight out and gradually descend deeper on the slope. As you go you will pass some artificial reefs. 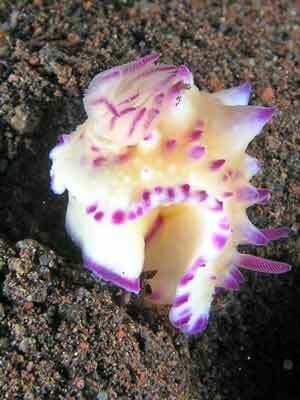 More about these at the end of the dive. We headed down a sort of gully and once at 25 metres we turned left and headed to a ridge. 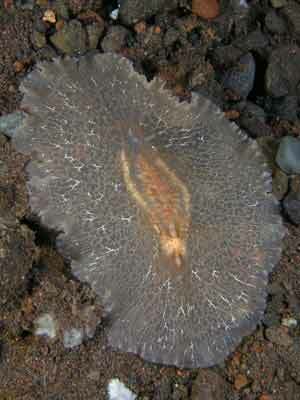 Like most other dives sites in this area, the bottom has small coral outcrops on the ridges (not many in the gullies). Once at the ridge we turn left and zig-zag across the ridge and back up it a little towards the shore. On the way we see a large moray eel with cleaner shrimp (try taking out your reg and opening your mouth and putting it close to the shrimp - they will jump in and start to clean your teeth and mouth). 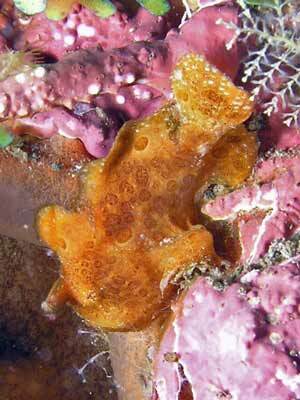 We also saw a lot of different crabs (including orangatan crabs) and shrimps but not so many nudibranchs. Kelly also found a small ornate ghost pipefish. We moved up a bit again to 16 metres and spend 15 minutes at this depth before ascending back to 10 metres for a while and then to five metres for a safety stop. In this area as I mentioned there are some artificial reefs. One is a dome-like structure built from reinforcing steel and the other an airplane also built from steel. The idea of these is that you attach pieces of live coral to the steel with cable ties or rope and within a short time the coral starts growing and then "glues" itself to the steel. 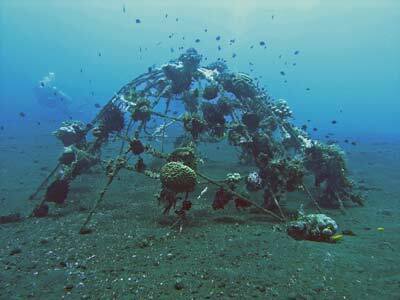 Over time, the corals join up and while the steel will rust away, the new coral structure becomes self-supporting. 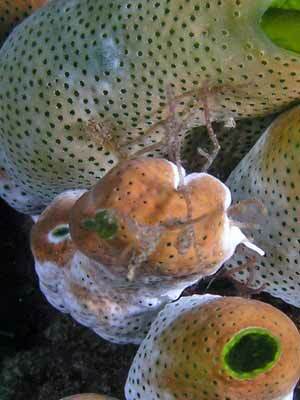 I think that the ghost pipefish Kelly found was in the coral on the artificial reef. All in all, the idea is working. Anyway there is a lot of marine life here, including lots of firefish (lionfish). After the dive we purchased a couple of cold drinks from the shop and sat around having a good surface interval. We chatted to some of the other divers and watched a large group of Japanese divers who all had cameras with the same make of housing play with their gear. I was amazed to see that many were still using film cameras. There is also a freshwater shower where you can wash the salt off you. After a bit over an hour's interval we did our second dive. Once again you enter the water and head straight out. However, this time we descended a lot slower and it took us 12 minutes to get to 21 metres. When we get to this depth we turn right (to the south-east) and stay at this depth for about 10 minutes. As per the previous dive, the bottom is black sand with small coral outcrops. 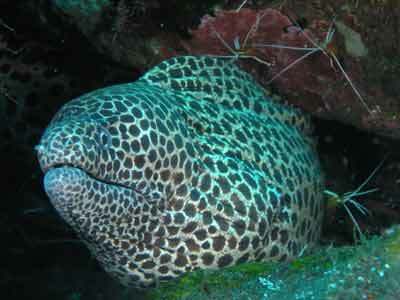 We see a moray eel and a spotted eel with cleaner shrimp (two different types). 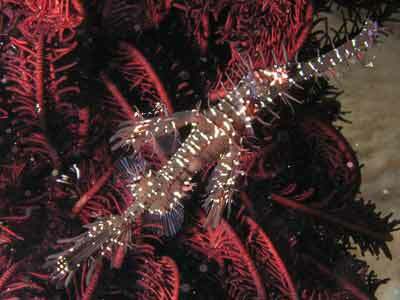 There are also two ornate ghost pipefish on the same coral outcrop. 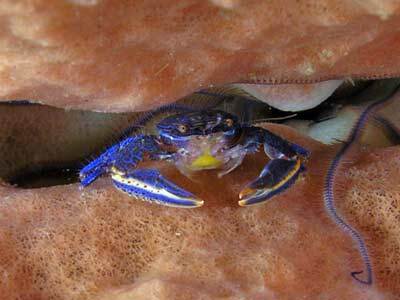 There were also more crabs, including the incredible pom-pom crab and the colourful soft coral crab. 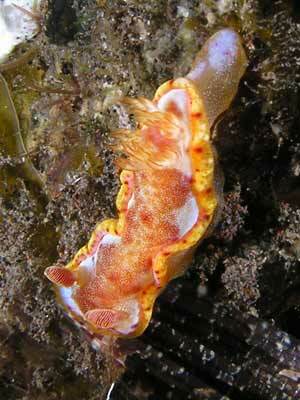 There are also lots of species of nudibranchs, including a very strange looking one (details to come of species). 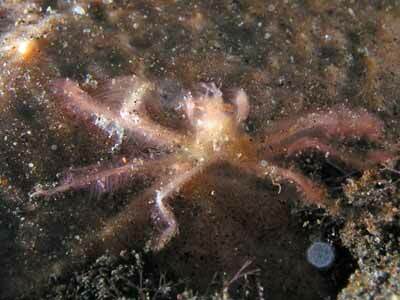 We also see a small octopus, which sort of looked and behaved like a blue-ringed octopus. 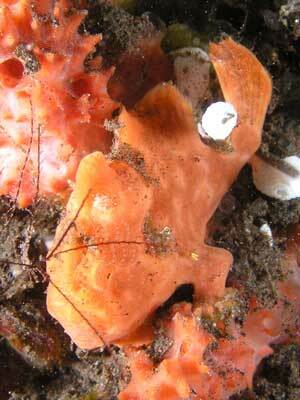 Back at the artificial reef we see another small orange anglerfish as well as the firefish. These were excellent dives, with brilliant things seen. The visibility was probably 20 to25 metres and the water temperature was about 27ºC. Click here to see the dive profile from my computer from the first dive and here to see the dive profile from my computer from the second first dive.